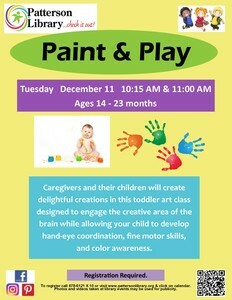 Caregivers and their children will create delightful creations in this toddler art class designed to engage the creative area of the brain while allowing your child to develop hand-eye coordination, fine motor skills, and color awareness. For ages 14 – 23 months. For more information or to register contact the Patterson Library at 845-878-6121 x10 or go to www.pattersonlibrary.org and click Calendar.